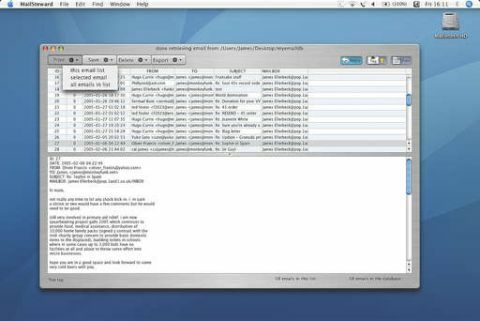 MailSteward is one of those unassuming Mac utilities that enjoys great kudos in the online Mac community. This might have something to do with the fact that the developer does a sterling job of staying in touch with his customers, but it's more likely because MailSteward is such a damn useful application. Essentially a database tool for backing up emails, it works with most mail clients, copying over old emails and archiving them and their attachments in a new database on your desktop. When you click on the database file, MailSteward opens up and shows you a list of the emails it contains and you can either scroll down that list or run text searches of the whole database. A separate Preferences panel is on hand if you need to merge files back into your mail client, repurpose them - or trash them. That's an overview of the main functions, but there's so much more to explore - the developer works around the clock to bring out new updates. You can search the email database by Date, Subject, Mailbox and other normal email indices. Meanwhile, your old email is left untouched in your mail client's folder, which means you're free to delete older mail in that and free up processing speeds whenever you go to check your Inbox. If you have thousands of emails clogging up your system on a regular basis, MailSteward is something of a must-have. Even the demo version is fully featured, capable of handling up to 3,000 emails before you need to buy a registration.